This year, Dublin School held its first full-day conference to honor Dr. Martin Luther King, Jr.’s life and legacy. Last year, the Students of Color Alliance (SoCA) galvanized efforts around planning, hosting, and executing the school’s first Unconference, which they called “SoCA’s a Seat at the Table Unconference.” This event—which involved topics like stereotypes, representation in the media, and internalized racism—involved an evening of student-led workshops facilitated with questions generated by participants. Grounded in that community-centered, student-led movement, this year’s SoCA members decided to bolster the foundations established at the last Unconference with a new conference set during the academic day and open to more faculty and staff members, as well as to Alumni of Color; they proposed to hold the conference on January 21. Coupled with the school’s recognition that our community deserves to honor Dr. King’s legacy with a meaningful program—and, historically, has not given the day the time and full attention it requires, Dublin’s first full-day Dr. Martin Luther King, Jr. Day Conference emerged. The day began before the sunlight glimmered over the mountains; it began with an all school weekend reading of Dr. King’s “Letter from Birmingham Jail” and Dr. George Yancy’s “Dear White America,” which grounded the thought-provoking conversations to follow. On Monday morning, Ms. Rachael Jennings, Director of Equity and Inclusion, gave a welcome address; in her remarks, she highlighted the “constructive [...] tension which is necessary for growth” that Dr. King wrote about, and she asked the school community to lean in to genuine questions, vulnerability, and discomfort—all in the pursuit of becoming more just. Dr. Amir Jaima, ’00, was the keynote speaker. A Dublin alum, Dr. Jaima is an Assistant Professor in the Department of Philosophy at Texas A&M. His keynote address centered on the difficulty of having courageous, generative conversations on race and racism in multiracial spaces. While addressing structural, institutional, and interpersonal racism, Dr. Jaima invited the audience to become true students, which he described as people who know that there is always more for them to know. “The student,” he said, “is, in fact, the wisest kind of person.” After his keynote address, students met with advisory groups to debrief and to set expectations for the day. 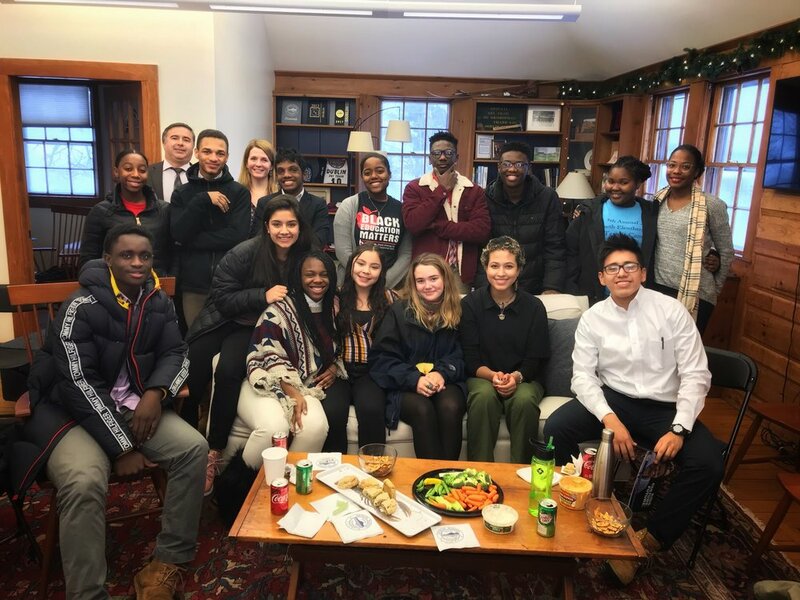 When the community reunited, Mr. Eric Russell, Associate Director of Development, moderated a discussion with four visiting alumni: Amir Jaima ’00, Tyson Laa-Deng ’13. Alexandria Farrell ’08, and Maurice Willoughby ’84. They spoke of their experiences at Dublin and their hopes for the future; in addition, they gave advice to the Dublin community. “Learn to be uncomfortable, and be okay with it,” said Willoughby. Share what you learn. “Ideas, when shared, increase in value,” said Farrell. Those statements guided SoCA’s Unconference, which was held across the span of the rest of the day. During the Unconference, the community attended four of eight dynamic, informative, discussion-based sessions: Blessing Akinmade (’21), Harniqua Bodie (’22), and Almesha Duhart’s (’22) session on Cultural Appropriation; Celeste Hopson (’20) and Kyle Mincey’s (’19) session on Institutionalized Oppression; Gabriela Quintero (’20) and Kusum Aryal’s (’21) session on Internalized Oppression; Dereck Elmera (’20), Salah Maalim (’22), and Exavion Clerveau’s (’21) session on Microaggressions; Lucy Selby’s (’20) session on Recognizing White Privilege; Arthur Garcia (’19) and Syan Maity’s (’21) session on Representation in the Media; and Emma Louise Williams (’19) and Tatiyana Dunkers’ (’19) session on White Supremacy. A group of faculty members and spouses—Mr. Eric Russell, Ms. Jung Yun, Mr. Eric Nemitz, and Mr. Chris and Ms. Rosy Speers—led a session on Interracial Couples. Students led the sessions courageously, and the whole student body rose to the challenge of having candid conversations. Students processed openly, looked inward, shared thoughtfully, embraced messy, unfinished dialogue, and reflected with the true spirit of Dr. Jaima’s “student:” one who always has more to learn. During Dublin’s Inaugural Dr. King Conference, the school community took one step toward standing up for something bigger than ourselves.